Written for architects and Java experts, this paper, originally presented to the International Symposium on Memory Management (ISMM), describes how C4 differentiates itself from other generational garbage collectors by supporting simultaneous – generational concurrency: the different generations are collected using concurrent (non stop-the-world) mechanisms that can be simultaneously and independently active. 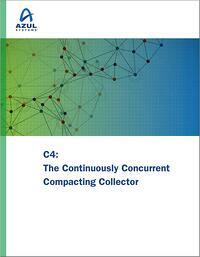 The C4 Continuously Concurrent Compacting Collector, is an updated generational form of the Azul Pauseless GC Algorithm. This paper was originally published in the proceedings of the ISMM 2011, copyright ACM, 2011. Available here under license.